Peel beets. Cut beets into ¾” pieces. Set aside. Cut peel and white pith from grapefruits. Working over bowl, cut between membranes to release segments. Drain segments, reserving 2 tablespoons juice. Cut segments into ¾” pieces. Whisk vinegar, mustard and 2 tablespoons reserved grapefruit juice in small bowl to blend. Gradually whisk in oil. Season to taste with salt and pepper. Toss greens and ¾ cup dressing in large bowl. Season to taste with salt and pepper. Divide salad among 10 plates. 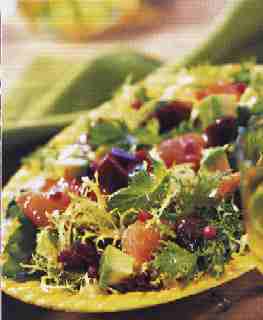 Scatter beets, grapefruit, avocados and pomegranate seeds over salads, dividing equally.